Memorable Wedding: Want to Wear a Blue Wedding Dress at Your Wedding? Want to Wear a Blue Wedding Dress at Your Wedding? Blue can be calming, vibrant, bold, or warm and it has a special place at weddings. "Something blue" has been a part of weddings for centuries. Ancient Romans wore blue as a symbol of love and fidelity and before the late 19th century, it was actually popular for a bride to wear a blue gown. If it was good enough for the Romans, it can certainly be good enough for you! 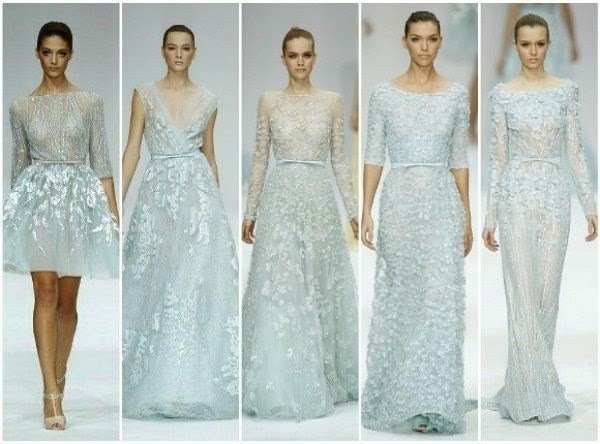 There are so many shades of blue that you have for your dress or incorporated into the design of your dress depending on the season you will be married in or the tone you are trying to set. For a winter wedding, midnight blue embroidery would be stunning or for a summer wedding, you could have a turquoise or aquamarine in your dress. Blue is such a common color for a bridal party because it is so versatile. Cobalt in the early fall, navy in the winter, periwinkle in the spring, and sky blue in the summer are just a few of the seasonal variations of this color. You can have one of these colors for your bridal party and then accent your own dress with the hue through embroidery, rhinestones, or sequins. Add some sapphire colored stones to your headpiece and on your veil to tie it all together. For a hint of blue, have your seamstress add soft blue chiffon to a ruffled train or a little blue tulle poking out of the bottom of the dress. Much like any part of a wedding, you can be blue under the radar or over the top. If you are going to be married in the winter, consider having a blue wedding jacket made to wear over your dress. This will allow you to take stunning pictures in the snow and then reveal a modern dress to your guests at the reception. No one should question this color choice for your wedding gown, as the saying goes, "Marry in blue, lover be true."